The Fin Sharky is a variation of the K-19 with a dorsal fin. The fin might not improve the flight performance, but doesn't seem to deteriorate it much either. Adding the fin may make the fuselage latch less secure, but still good enough when well implemented. And, the two sides of the fin look a little different, making the asymmetry of the K-19 design more apparent in the fin sharky than the standard sharky. (For a detail view of that see page 4). 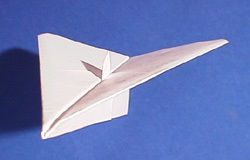 A Fin Sharky can be made with the "angle under" variation, but not the "angle over". The instruction shown here is based on the Standard Sharky, and departs from it only in the construction of the fuselage latch. One of the flaps is angled up to protrude from the top of the fuselage instead of tucked inside it. 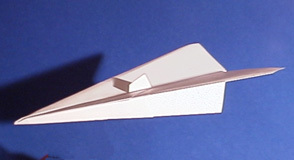 The fin can be larger or tilted back more than the one depicted, but doing so tends to be at the expense of strength in the fuselage latch. The range of options will be determined by the exact geometry of the folding up to the step where you're ready to make the fin. To follow the creation of a Fin Sharky in its entirety, simply view the Standard Sharky instructions and diverge to the Fin Sharky variation via the link on page 9.